As a first-class boating destination on Australia’s east coast and the largest marina of its type in Australia, Abell Point Marina is a common launching place for boat tours and a temporary home for boats. But its quality facilities aren’t the only reason people visit this iconic spot. In the past few years, Abell Point Marina has developed a reputation that extends far beyond its transport hub. 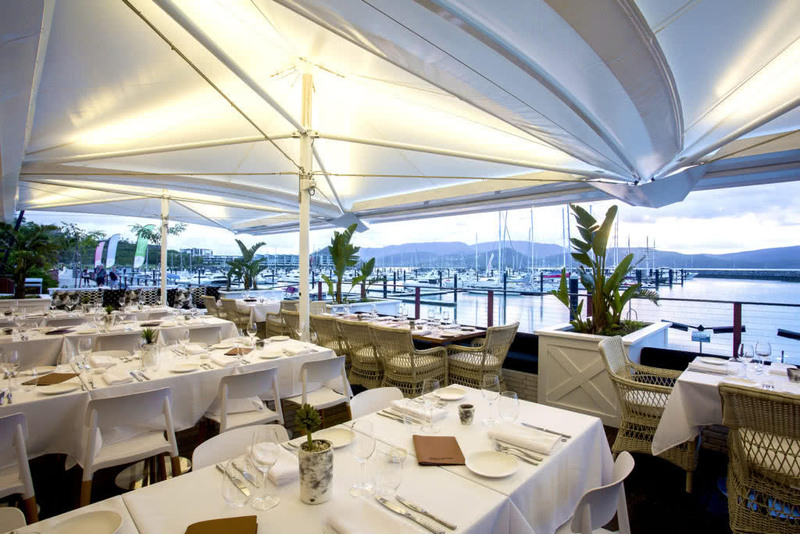 It now presents a range of fantastic new dining options in Airlie Beach. Here are 5 reasons you’ve got to head over to this fabulous marina for a quality meal! Located right in the heart of the Whitsundays, Abell Point Marina is located a simple, short walk from Airlie Beach’s town centre along a beautiful boardwalk. Grab a table on the boardwalk with a beer or glass of wine and enjoy stunning views of crystalline waters and the boats. Time your visit and watch the sea and sky turn a variety of shades as the sun sets over the mountainous horizon. Abell Point Marina is also the gateway to the Whitsundays’ 74 islands and an access point for Great Barrier Reef, making it an ideal stop for refreshments after a day’s adventures on the water. Abell Point Marina aims to deliver exceptional service so you have fabulous memories of your stay long after the tan has faded. You can expect quick and friendly yet professional service thanks to the well-trained staff and efficient point of sales in every marina venue. Every venue is designed to serve your needs, from the relaxed atmosphere of Sorrento to help you wind down as you watch the sunset, to the quick-service Kiosk Cafe. Whether you’re looking for a healthy breakfast before your day’s adventures, a hearty seafood lunch, or after-dinner cocktails, the marina district has plenty of quality food on offer to satiate your appetite. Start your day on a health kick with Bohemian Raw’s superfood-focused breakfasts and stock up on some essential day snacks from Kiosk Cafe. Dine on modern Australian cuisine for lunch and follow it up with an artfully prepared cocktail at Hemingway’s. Then savour the flavours of Sorrento’s Italian-inspired menu with a delicious pizza and wash it down with a beer as the sun sets. Past visitors to Airlie Beach would be surprised at how much the marina has grown. Long gone are the days of a single kiosk! Marina owner, Paul Darrouzet, has made it his mission to turn the marina into the Monaco of the Whitsundays coastline. The marina has been recently redeveloped, so you can enjoy brand new, well-designed facilities as you experience fine dining. This includes 3 new restaurant-bars and cafes, a state-of-the-art function and event facility, some new areas to relax on the foreshore with your takeaway meals, and upgraded private amenities. Having first-class restaurants and tapas cafes just a skip away from where you dock your boat is the ultimate luxury! Abell Point is equipped with 517 berths, concierge services, and 24-hour fuel and security. After a long day at sea, imagine docking your boat and strolling just a few steps for an artfully prepared cocktail at Hemingway’s or beer and pizza at Sorrento’s. With modern facilities, friendly service, scrumptious food, and unparalleled sunset views, there are plenty of reasons to dine in the marina district. Discover the various delights at the Abell Point Marina today!